Happy Wednesday and happy WIAW! I am sitting on my couch, sipping coffee. We have a chance of blissful 30ºC today. It’s already sunny outside and I can’t wait to wear shorts 🙂 Oh but I have to shave my legs first. That’s one thing I envy guys about – no need to shave their legs… but I digress… A new Irish Pub has opened in the neighborhood and my sister and I are going to have breakfast there. Scones, Pancakes or a Muffin, I am already looking forward to a blissful breakfast treat! But first I am going to show you my wonderful Tuesday eats. As part of my new Tuesday routine I had breakfast at home. I chose a little breakfast bowl with oats, coconut, soy beans, soy yoghurt and soy milk. I realize when I type this that I had pretty much soy. Then I went to Crossfit. After Gym I needed something fresh. So back in the office I enjoyed a yummy green juice from Harvest Moon. Mango, Peach. Spirulina and Wheatgrass. I couldn’t make it long until I got insanely hungry and so I had an early lunch. Roasted Veggies with some leftover pesto and garlic butter. Oh my gosh this was so good. I loved every single bite and if I had been alone n the office I would have licked my plate. 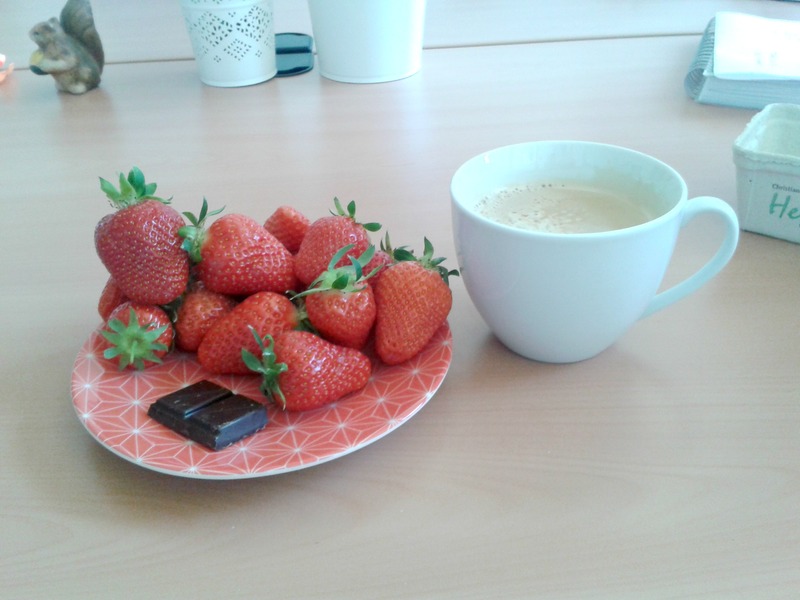 As a dessert I had a pound of strawberries with some dark chocolate and a cup of coffee. I swear hands down this is the best combo ever! 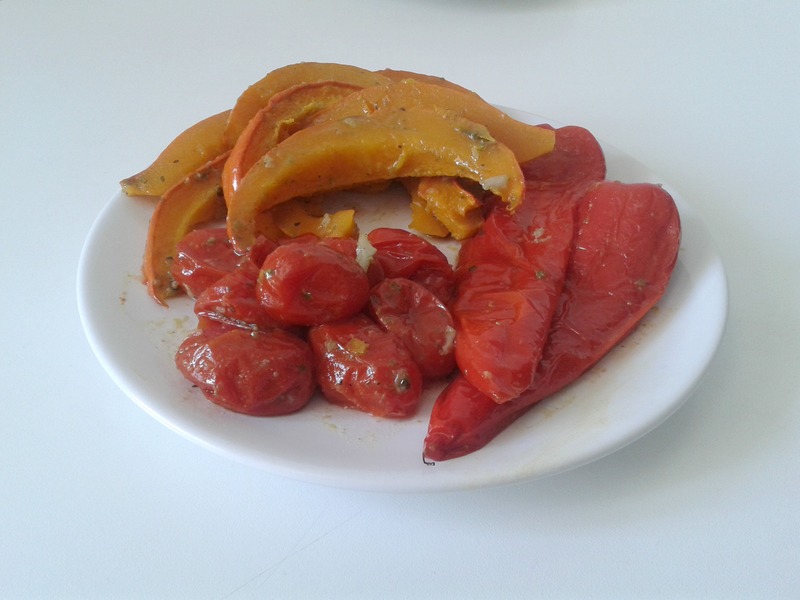 Rich, bitter, sweet, juicy – all the best! Stefan had a meeting at the soccer club and I made us dinner and prepared his breakfast and lunch for today. I also opened a bottle of white wine and we enjoyed a glass along with our dinner. 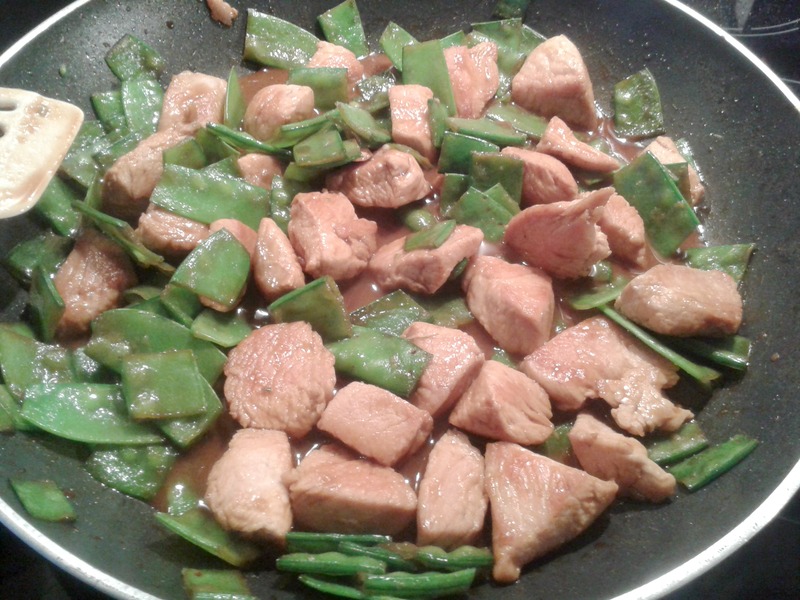 A chicken and sugar peas stir fry with soy sauce and peanut butter. So easy, so yummy. I was pretty exhausted and crashed on the couch soon after. So for today breakfast out and working in the sun is on the schedule. Sounds good, doesn’t it? And in the evening I have soccer practice. I really consider quitting so I will go even though I am not really motivated. Could be one of the last times. But I haven’t decided yet. I’ll see over the next weeks how things develop. Are you already excited about summer my Northern Hemisphere friends? What do you like about winter my Southern Hemisphere friends? What was your best meal yesterday? Any good summer snack ideas? I am not looking forward to anything about Winter. Anything. I don’t even want to think about it lol! It’s interesting how your hunger has changed since switching up your workouts! Embrace it! Summer snacks? smoothies!!! Oh yes, that’s indeed a good idea to pimp up the veggie a bit. Oh yeah smoothies are really a grat summer snack. If only it was easier to take them to work. I am SO glad we are just starting our summer, winter was so brutal that I need a good melting summer! 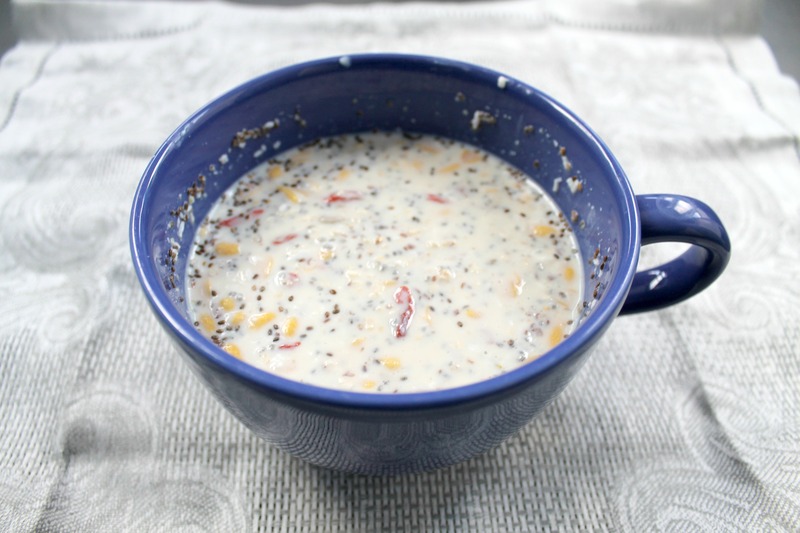 Your overnight oats sounds lovely! I am not sure I could get by with your meals though….with my miles, I would pass out 😛 I am always hungry anyway, so that is no change for me, but I am sure you will enjoy your new breakfast spot todya! I am sure you burn my entire day of calories before breakfast 😉 If I ran like you I would need to up my intake immensely. Funnily when I run I am not hungry at all and always need to force myself to eat. I really wonder why…. Mmm, your dinner looks so simple but so tasty! I bet the flavors just taste so great together! Everything looks delicious! We are just now getting some good hot spring weather where I am…my favorite part is definitely the sun & going to the beach! Thank you 🙂 Oh yeah, going to the beach sounds divine! Mmmm strawberries & chocolate sounds like a good snack combo! Ok those roasted veggies have stolen my heart 🙂 ! I am loving summer! It makes me crave fresh and crunchy veggies! I am loving my shrimp and baked potatoes still too haha! Lately I have been snacking on dark chocolate squares and almonds! The combo is so good! I want those strawberries w/ dark chocolate!! The workout looks brutal but oh so good. Love the high you get after them! If I wasn’t craving summer and summer produce before, well I definitely am now after seeing all your gorgeous pictures of roasted veggies, stir fries and delicious berries. I want it all. Good luck with soccer; hope you figure things out. 😀 Haha that’s exactly what the coach told me: Imagine you’re a Ninja and land on your feet soundless. Thanks, lovely. I think I am in the process of figuring things out.